Welcome August and the last days of summer. We hope y'all have enjoyed your summer thus far as we've had a blast. Here in beautiful Blowing Rock, #TeamCamp has been climbing, mountain biking, hiking, camping, canoeing and much more. If you are looking for a spot to have an adventure then come on up the mountain and see what our town has to offer. 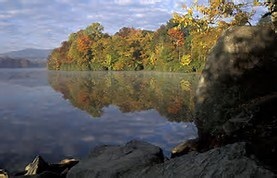 The focus of this article today is Price Lake, one of the local favorites. Crystal clear water with views of Grandfather Mountain. Today we wanted to tell you about one of our favorite spots to play outside, Price Lake. If you head south on the Blur Ridge Parkway from Blowing Rock, just a few miles down the road you will find one of our favorite spots to trail run, canoe, hike, camp, and just enjoy Mother Natures incredible views. Plenty of amazing campsite to choose from, offering a variety of features and amenities. If you want to set up camp and relax by the lake, this is the perfect place. Lots of plush features makes this almost "glamping". See the map below to find all the spots. If you plan to reserve a spot in advance, which we highly recommend, take a look at the numbers on the map. The ones on the lake fill up fast for a good reason...they are super sweet! The lake loop and the boat launch are choice. Now that you have your campsite dialed it, time to plan an adventure or two. 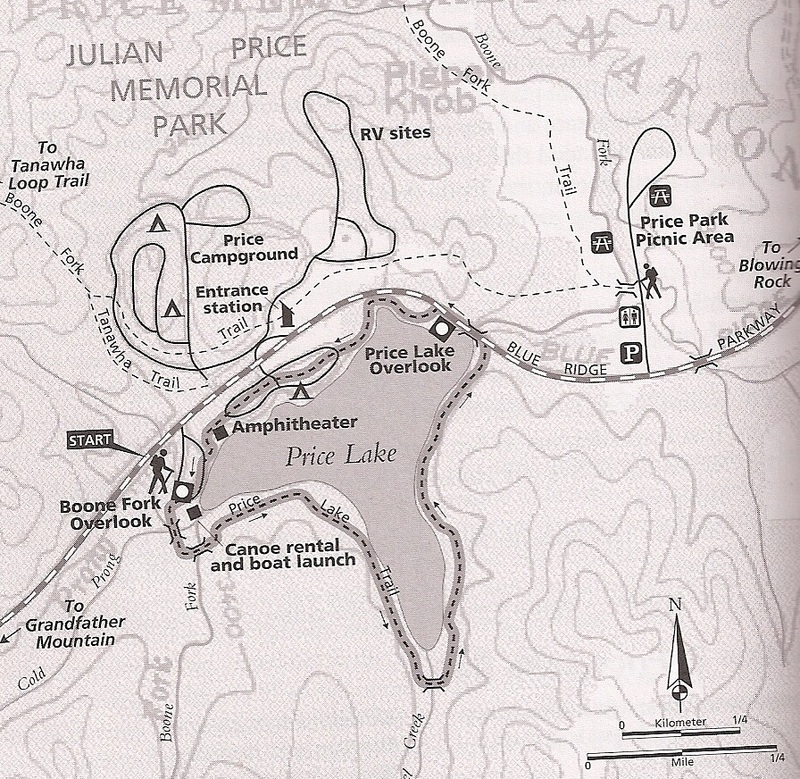 The next map has a loop around the lake that is great for a chill walk with the kids or those folks just getting in to the hiking game. Be advised, if it has been raining this one could be a bit wet. The map below also has the location of the boat rental dock. I've taken the family here many times on a canoe ride and we love it. They offer life jackets as well. Also, if you have your own (nonmotorized craft) bring it along and hit the water. Be sure to check this area out. A solid dose of mountain trail. So you've checked out the lake loop and the kids loved it but you want more...no worries my friends, the Boone Fork Loop is waiting to break you off a piece. 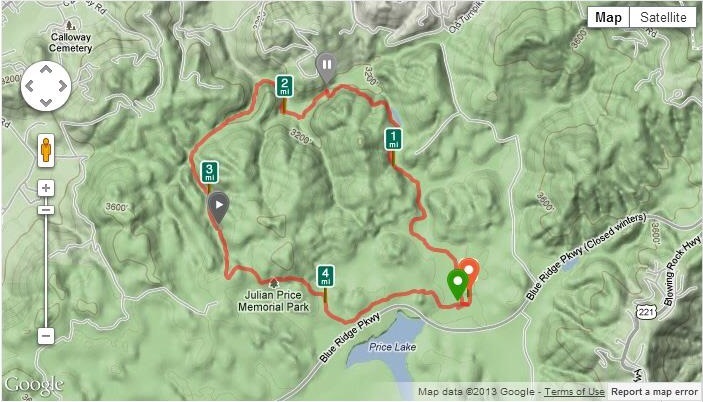 Accessible right across the street from Price Lake, this is hands down one of the best trails around if you want to get a dose of these amazing mountains in a 5 mile loop. Waterfalls, rhododendron caves, open woods, craggy rock moves and amazing views along the way too. Bring some water and wear good shoes for this one. The trail is well marked and passes through Julian Price Park as well (another really cool spot). Make sure to hop off the trail and check out Hebron Falls and one of its many swimming holes too. Be advised : if you see a sock or some undies hangin from the trees on the way to a swimmin hole, that's mountain code for skinny dippers, nuff said. See the map on the right here to get a look at the loop. "Let's go outside and play.. but first, coffee!"